The intermittent rains have made our self-serve Farm Stand be in a continual flux between open and closed, so Thank You for your willingness to work with those logistics. Check out the barn progress! 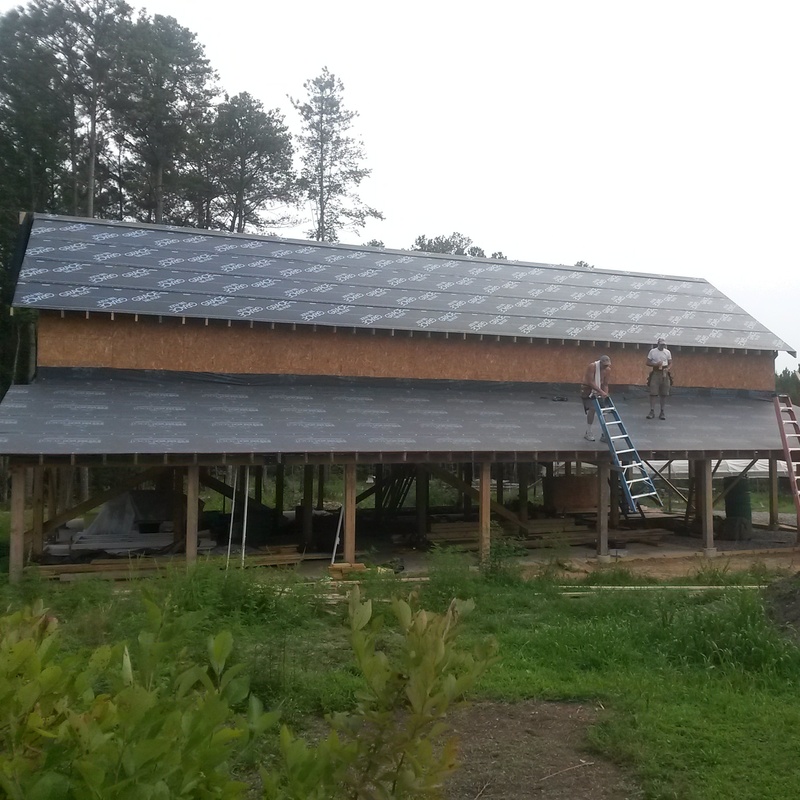 Next step is to get the metal roof on, and we are waiting on our electrical permit. Once we have the walk-in cooler built inside the barn, we will move our CSA vegetable pick up area and self-serve Farm Stand into the front (covered and weatherproof!) section of the barn. We’ll keep you posted. We have to balance this work with our main job of growing and selling these vegetables, so these next couple of steps won’t happen overnight. (And we do have a baby to birth and welcome into our family this fall. So things are plenty busy.) Thanks for your patience, and get excited for an official Barn Warming Party next spring to kick off the 2015 season! A few of our customers have asked us for our thoughts on the article about Chesterfield farms (or the lack thereof) and farmers markets (or the desire for many more) that was published in last week’s Chesterfield Observer. The article’s main point is that there is currently a large demand for Farmers’ Markets in Chesterfield, but not enough Chesterfield produce growers to support the demand. As a full-time farming family and business, our perspective on this situation seems relevant, so we want to explore further some of the ideas presented in the article. We agree that, as the article states, it seems that “everyone wants a farmers market” in Chesterfield. We have been a vendor at the wonderful Brandermill Green Market (in Chesterfield) for 4 years now, and during that time we have been approached about our interest in selling at no less than TEN other potential markets within just a few miles from Brandermill. To every inquiry, we have enthusiastically encouraged all interested shoppers (and would-be market organizers) to visit the Brandermill Market instead. There are two reasons for this. One: Despite our ability to make farming a full-time business for us (we are just starting to support our family with income solely from the vegetables that we grow and sell — a status that we have worked hard to transition to over the past few years), and despite the impressive amount of vegetables we are able to produce (currently feeding the equivalent of 120 families’ worth of vegetables this year, from less than 1.5 acres of cultivated land)…Despite these facts, we are a tiny farm, a very small business, and we always only sell what we have grown ourselves, on our farm. We also sell our vegetables at a farmers’ market in Richmond, and through our own CSA program (where customers invest in the farm financially in the winter or spring in exchange for vegetables picked up later in the season). To add any other markets to that list would be impractical. For the size of our farm business, it is only practical to have, at most, two market outlets. This ties directly to our second point. Two: To support a business, a market (like a storefront) needs to have enough customers, making enough purchases, to support the expenses of that business at that location, including paying a living wage to the owner/operators. Currently, the Brandermill market doesn’t have a high enough volume of purchasing to meet that need of ours. We need to sell more vegetables there to actually cover the costs of us growing, picking, washing, packing, transporting, setting up, and staffing the sales of the vegetables at that market. Each year of our farm business thus far, we have sold more vegetables to customers in Richmond than in Chesterfield because there are simply more people shopping at the Richmond farmers market, and more people in Richmond choosing to sign up for a CSA share. But we are completely committed to building up more traffic at the Brandermill market and our Chesterfield-based CSA, knowing there is interest in the Chesterfield community. We are patiently and persistently working to build up that interest. To ask small farms like us to set up at multiple markets with a small volume of sales at each would be like asking a small local restaurant to open up multiple storefronts and serve meals in multiple locations around the county, but fewer meals at each location. Like any business, we need to concentrate our sales at the appropriate number of locations in order to be profitable (ie: to be able to stay in business). The other option to support a large number of farmers markets with small produce purchases at each is to have backyard gardens/hobby gardeners supplying the produce for them. Growing and selling produce as a hobby or side venture to earn some extra income is a laudable venture but simply creates a different dynamic in our community. 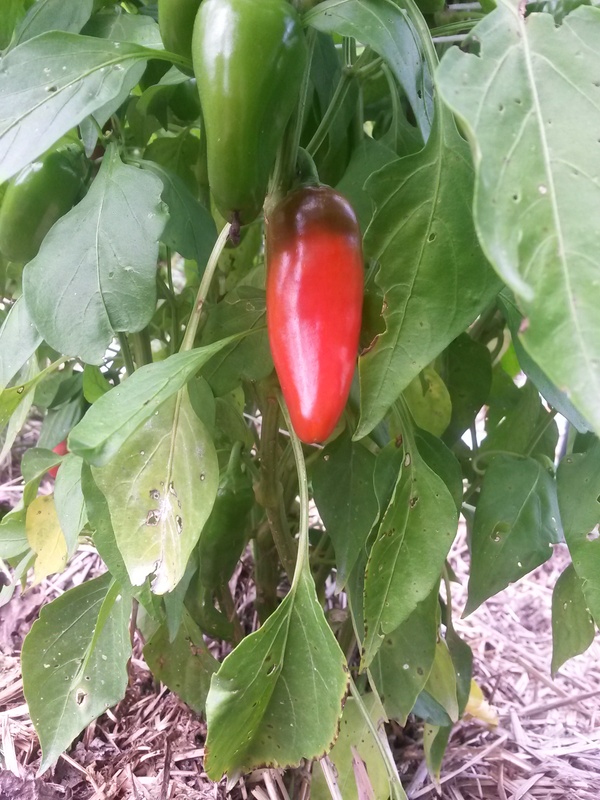 A business dedicated to (and financially reliant upon) growing produce for the community full time brings a greater range of produce (more diversity) and throughout more months of the year. A business like ours also brings a long-range commitment to staying in the business of growing food due to the high level of investment we have made in this operation. Chesterfield (and even Richmond) is really quite new to the world of modern day farmers markets. Having enough producers to sell at all the farmers markets currently desired around our county requires that growers not need to make a living from it. And so, we encourage our community to think about what we – Chesterfield – want. Do we want to support (and allow profitable business) from local farmers, dedicated to full time food production? This currently means that you may have to drive a little further to a market location than you may want to. Once there is enough demand for this product to make sales at multiple county markets high enough, then more markets can exist that support profitable, local, farm businesses. Or do we want a multitude of small markets in various neighborhoods, church parking lots, and housing subdivisions that each support a hobby garden? There are benefits and drawbacks to both. We, of course, prefer the first option. We think our role as professional farmers is valuable in our community and we want sales at a single Chesterfield farmers market to support our business for now. Perhaps two Chesterfield markets as our business expands. We have the extremely important additional detail of being a local farm that uses Certified Naturally Grown practices. (Pictured above is Dan at an event last weekend by the Virginia Association for Biological Farming where we presented about our experiences with a VABF tomato grafting research project — investigating the economics of tomato grafting on a small-scale, organic farm.) We are Certified Naturally Grown, for which standards draw upon the USDA Certified Organic standards. Most local farms do not use organic practices (which the Observer article alludes to), and we are extremely proud of and committed to this healthy way of growing food. The cost of our produce may be higher than those set by part-time gardeners selling their vegetables or by conventional (not organic) farms, but a communities’ willingness to pay the price for what it costs to grow organic produce, including paying a living wage to the farmer, is a positive reflection of a community’s healthy values. 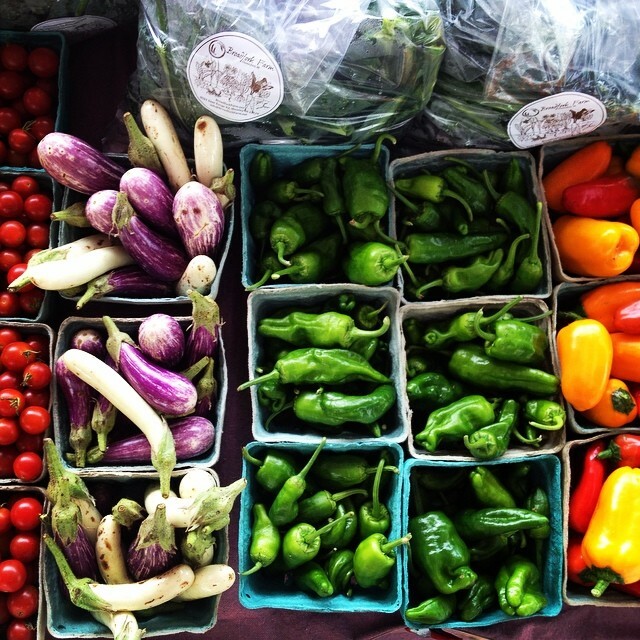 We hope this overview of the finer details behind local markets and local producers helps round out the current reality for Chesterfield, and we look forward to being part of the continued growth of our county’s commitment to local, organic farms and their produce. Our Farm Share Bag (consisting of a farmers’ choice medley of produce, in one easy to order option), Basil, Carrots, Chard, Eggplant, Garlic, Green Beans, Kale, Okra, Peppers (jalapeno, Sweet Lunchbox, sweet red, padron), Summer Squash, Sunflowers, Tomatoes (red and green slicers, including economy bulk option for seconds quality) …plus our Pepper Jelly.